A young couple from Heysham had a lucky escape when their car was surrounded by the tide at Sunderland Point. The couple were driving along Main Street in Overton and had stopped for a minute but before they knew it the tide had come in quickly around them, said the coastguard. Firefighters and crews from Morecambe and Fleetwood, together with water rescue specialist firefighters from Penwortham and 4X4 vehicles and crews from Lancaster and Leyland in addition to Coastguard personnel from Morecambe were sent to the incident at 11.05pm on September 19. Morecambe Coastguard Deputy Acting station officer John Hartwell said: “We were sent to two people trapped in a car but the fire brigade were already on scene when we got there. “Morecambe hovercraft and the inshore lifeboat were also en route but were stood down when they weren’t needed. 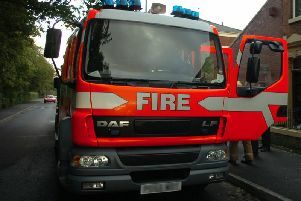 “Fire crews had managed to get the couple along a flood embankment and escorted them to The Globe. “They had managed to get their car up an embankment and got out before the tide swamped them. “They had only stopped for a minute but were shocked at the speed the tide came in which caught them unawares. The couple were uninjured after becoming stranded.